Last year, in May, you may recall North Korea grabbing headlines for its supposed test of the KN-11 submarine-launched ballistic missile. A closer look at that test revealed that, contrary to Pyongyang’s suggestion of having successfully ejected an SLBM out of one of its Sinpo-class submarines, the missile was launched from an underwater barge. Keeping in line with May’s test, it turns out that North Korea’s most recent KN-11 test was also exaggerated. I reported on the footage released by North Korean state media last week, days after the country’s fourth nuclear test, purporting to show, once again, the successful ejection of one of its SLBMs. Initial bits of analysis suggested that the video re-used footage from old missile launches and, generally, appeared fishy, with several long-distance shots and rapid cuts. Well, an eagle-eyed analysis of the footage by a team of analysts at the Center for Nonproliferation Studies in Monterey, California (seen below) reveals additional important shortcomings in Pyongyang’s video editing abilities, revealing that the most recent SLBM test, like last May’s, was less successful than North Korea would have us believe. A post by Catherine Dill over at Arms Control Wonk outlines precisely what we’re looking at. 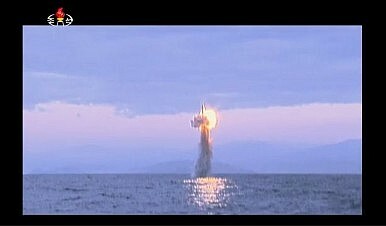 The most important point from her post is the following: ” Although the KN-11 appears to eject successfully, which is an improvement over November, we think that a catastrophic failure occurred at ignition.” As Jeffrey Lewis puts it, the SLBM “went kablooie,” not long after ejection. That conclusion is based on the KN-11’s suspected similarities to the Soviet Union’s R-27 design. By comparing North Korea’s released footage with a successful R-27 launch, it is quite apparent that the KN-11 footage suggests a partially successful launch at best (successful ejection followed by a botched ignition). Still, as Dill notes in her post, it’s unclear if comparison to the R-27 is entirely apt. It is possible that North Korea’s design is expected to behave differently after ejection. The good news here is that North Korea’s SLBM program is not quite to the point where it’ll give Pyongyang a game-changing second-strike capability. Indeed, equally important to Pyongyang’s ability to successfully eject and ignite its KN-11 will be its ability to successfully miniaturize a nuclear device for the missile’s tip. Both milestones appear to be out of Pyongyang’s range for the moment, but make no mistake: Kim Jong-un has his best people working toward those goals.